This tutorial shows you the basic of OAuth using Apache Oltu (Formely known as Apache Amber). We have created a Java Web Application that authenticates the user to Facebook via OAuth 2.0 and retreive the protected resources from Facebook. 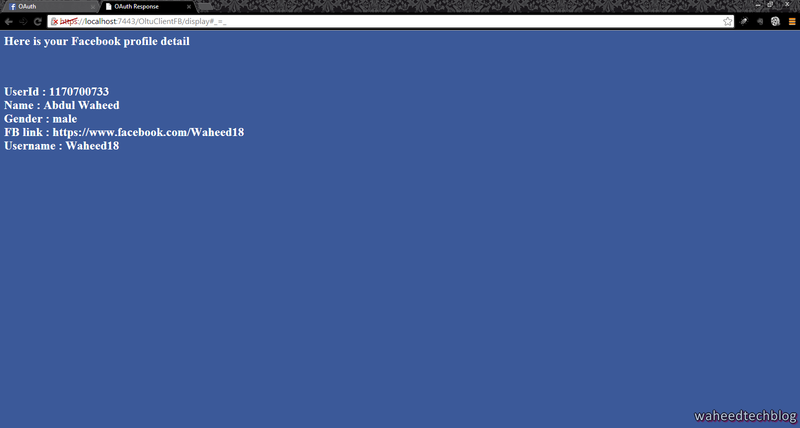 Registered Facebook Application. Check here for instruction on How to register App on Facebook. 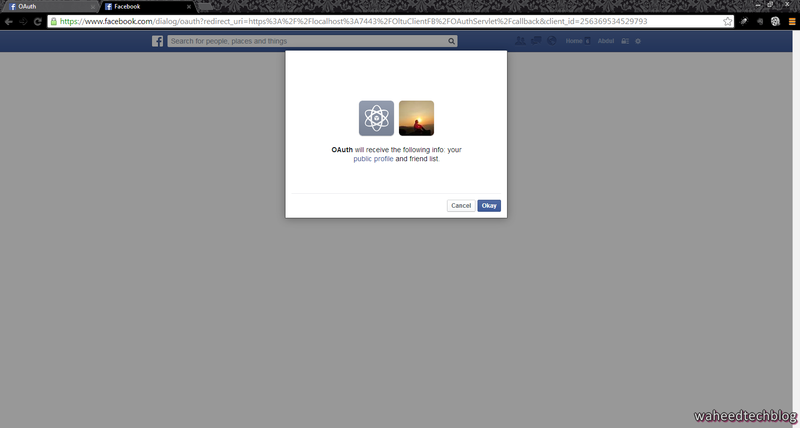 Download the OltuClientFB Application from the GIT repository. Once you click on “Okay” button. It will display your profile detail like UserId, Name etc. In the Servlet initParams, We have defined the clientId, clinetSecret and the redirectUri, You can change it as per your Apps. The Java Web Application act as a third-party website or termed as “client” which operate on behalf of a user. 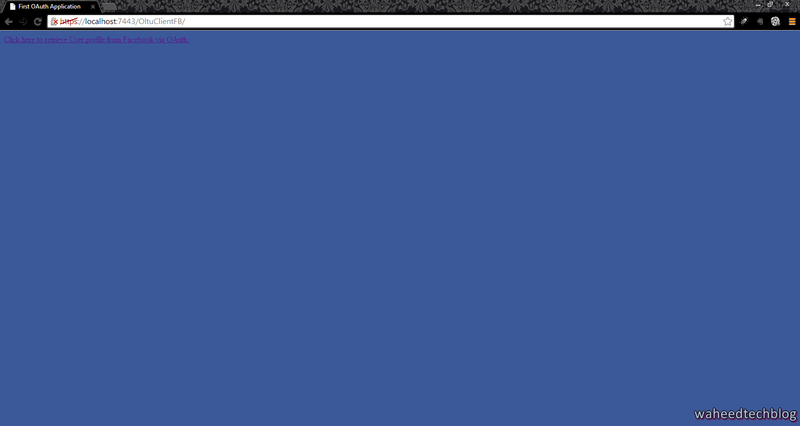 It first sends the request to Facebook which authenticates the user, obtain the user's authorization(i,e Approve/Deny page) and issues an access token which client can use while interacting with the resource server i,e Facebook to access public profile of the user. Created the End User Authorization Request by providing end-user authorization URI at the Authorization Server (e.g. 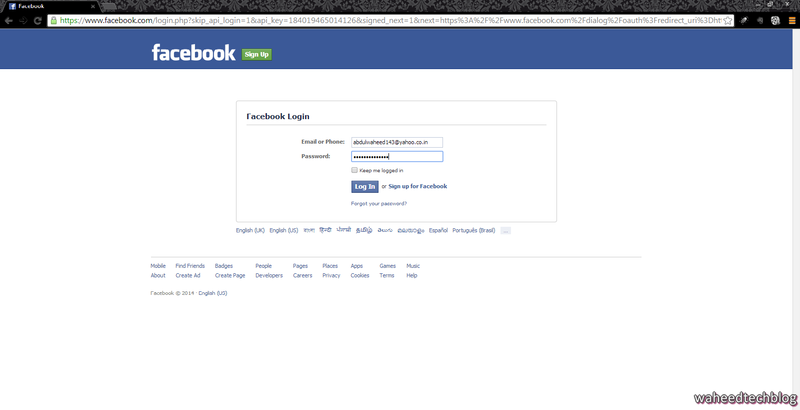 Facebook), application's client id and a redirect URI in order to receive the authorization code. Apache Oltu has an enum OAuthProviderType for authorization and token endpoints of common OAuth 2 providers like Facebook. The above code will produce an OAuth request where all the parameters are encoded in the URL query. Once the user grants permission for your client application, then the Facebook will redirects the user to redirectUri with the code in the request parameter. Apache Oltu has two different classes to parse the access token response. Facebook’s response is not fully compliant with the final version of the OAuth 2 specification, but it can be parsed using the class GitHubTokenResponse. This class will display the user profile on the UI. This application demonstrates the basic of OAuth 2.0 using Apache Oltu i,e how to authenticates the user and retreive the protected resources from Facebook. Hey great post! Can you post the link to your github source? I am trying to build a Oauth2 client in java and am new to the server world would love to see a full example. Hey sorry for the late reply. I have not uploaded on githubs but I have zipped it for you, just download it from here(http://www.4shared.com/rar/0Njd4RC0ce/OltuClientFB.html), import into Eclipse, change the Id,Secret and Run the application as Server. can u pls activate http://www.4shared.com/rar/0Njd4RC0ce/OltuClientFB.html for me? Hey could you share me your email ID. I ll send you as zip. Your code is not downloadable. Could you please upload the code on github repository. It will be worth for all your followers.